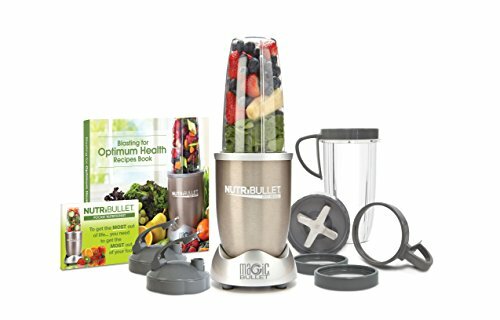 Home » Kitchen Gear » Best Smoothie Blenders 2019 (From a Real User) » What’s the Best Personal Blender for Crushing Ice? Looking for the best personal blender for crushing ice? Having used several personal blenders of the years, including many from the Nutribullet and Ninja range, we've got a few picked out that are going to get the job done. Which personal blenders are best for great for crushing ice in your smoothies (and why we picked them). A few helpful videos on blender tests we've done. Nutri Ninja Auto-IQ Personal Blender – It’s small, it’s affordable and it’s super powerful. It’s probably the best personal blender when it comes to crushing ice right now. 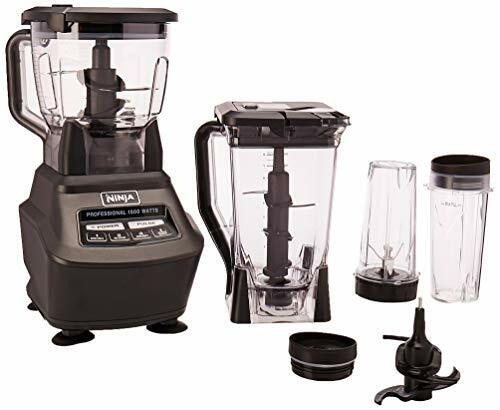 Ninja Mega Kitchen System – This one is second simply because it’s not your typical personal blender. It transforms from a large counter-top blender to a small personal one just by swapping out the cups. But it gives you so much flexibility and both modes are great at crushing ice. Nutribullet Pro 900 – I’ve been making frozen drinks with tons of ice in this Nutribullet for years now. As long as you’ve got enough liquid in there, ice will get crushed no problem. It even did great when I tested it with all ice and no liquid when we tested it. Why Are These Personal Blenders Great at Crushing Ice? What features make these blenders appropriate for crushing ice? First off, all of these blenders are powerful enough to get the job done. If you notice, we didn't pick the plain old Nutribullet 600 or Magic Bullet for this job. The minimum you want for crushing ice is the Nutribullet Pro 900 which has a 900 watt motor. If you don't have enough power and you're trying to make thick drinks with ice, the motor will just stall out. That's what I've found when the older Nutribullet models like the 600 watt. It wasn't as great at making thick drinks with ice. When it comes to the Ninja models, both the personal and the counter-top Ninjas on this list, they both have a motor power over 1000 watts. Most of the main blender brands have blades that are the perfect combination of sharp and dull. This allows them to chop and cut things, but not be so sharp that they'll dull out. The ice crushing power in these blenders comes from the motor and not necessarily the blades. Well, these all had to be personal blenders right? We only selected blenders that had to-go cup options. The Ninja Mega Kitchen system kind of has it all. But you can keep the large jar in the cabinet for when you really need it and only work with the personal ones when you want to make your ice-filled smoothie or shake in the morning. Why We Picked It: When I tested this small blender at crushing ice, it absolutely outperformed my expectations. Because of the blade design, it was immediately able to crush the ice into snow by creating a vortex ​and getting all the ice towards the blades. It also does a great job when the ice is in a smoothie, which is probably what you want it for anyway. It also comes packed with plenty of to-go cups if you want you bring your smoothies on the go. Who It's For: ​Because it's only really for single-servings, it's best for a small family of one or two. Don't expect to be making super large servings of smoothies or sauces in this thing. It's simply not big enough. Cons: No large serving option. 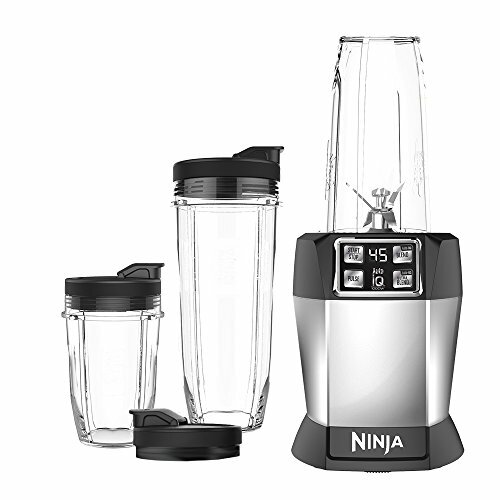 Why We Picked It: The Ninja Mega Kitchen System is so much more than a personal blender. It's a personal blender with counter-top blender and food processor capabilities. It has just as much ice crushing power as the Ninja Auto IQ listed above. However, when you want to make a large batch or chop in a food processor, you have that option. What's amazing is that it's usually not that much more expensive than the standard personal blender. Who It's For: Large families with slightly bigger budgets than the average personal blender. Pros: ​Powerful and extremely versatile. Has to-go cups but can also do large batches and be used as a food processor. Cons: A bit bulkier and slightly pricier. Why We Picked It: The Nutribullet Pro 900 is more than powerful enough to handle crushing ice in smoothies and making them smooth and easy to drink. I've even tested crushing ONLY ice in the blender, and it did a pretty good job. Who It's For: For a single person or two people, this blender is a dream. You can store it almost anywhere, and it's got tons of cups. Each person can make their icy smoothie in the morning and be out the door. Pros: ​Light-weight, affordable and plenty of to-go cups. Cons: Not recommended for crushing ice without liquid. In this video, I'm using the Nutri NInja Auto IQ to crush ice from my freezer. As you can see, it does everything in quick order. All of the ice cubes get whirled around and brought towards the blades. Within seconds, everything is snow. Now you can see why it was the top recommendation, right? If you go for the Ninja Mega Kitchen System, you'll also get a tall jar like the one seen here. This jar is even BETTER at crushing ice. But you don't have to use it all the time if you're short on counter space. You can use it as a personal blender and keep the larger parts stored away for when you need them. It's a win-win! The Nutribullet Pro 900 isn't designed for this task specifically and I wouldn't recommend doing it that much. But as you can see, it did a bang up job besides for a few ice cubes. See Also: Can the Nutribullet Crush Ice? The reason why the Nutribullet Pro 900 is on this list is because it's really great at making icy and thick smoothies. I've found that it does an even better job than the Ninja. In this video, I actually had a way easier time making a thick and icy smoothie with the Nutribullet. In my opinion, it has a better design when you're dealing with a combination of ice, frozen fruit and liquid. But as I mentioned, the Ninjas excel when you're doing ice on it's own. If you’re going for strict ice crushing (with no liquid) go with the Nutri Ninja Auto-IQ Personal Blender. If you’ve got a little more space and know you’re going to want to do bigger batches AND personal batches, go with the Ninja Mega Kitchen System. Finally, if you want something small that does a GREAT job at thick frozen drinks then go with the Nutribullet Pro 900. I strongly believe that you’ll be happy with all of them, so don’t worry too much! Want to see our current list for the top blenders of the year and different types?